Looking for professional marital counselling? Imagine if a professional marriage counsellor contacted you and saved you the time and effort calling people who don't answer their phones or put you on hold only to tell you that they can meet you in a month. My name is Mark Connelly. I'm a registered psychologist and marriage counsellor based in Claremont, Cape Town. Fill in your details on the form below and I will contact you to arrange marital counselling. My email or call is a 100% free, no obligation service. It really is this easy! I consent to you using my information only to respond to my request for marriage counselling. I'm very serious about ensuring that you get professional marriage counselling. After all, I have to uphold my reputation as a psychologist and marriage counsellor. I will email you or phone you to discuss your needs. We'll chat, and if you're happy we'll arrange to meet as soon as possible. I will try to refer you to a marriage specialist in your area if we can't meet in person. There are four things I suggest you can start doing right now. Quit blaming yourself or your spouse and start thinking about how to move forward. Blame can feel good but it can also be a barrier to positive change. Take responsibility for yourself. It's easy to get caught in the trap of feeling helpless and out of control. Decide that you can take action. Use expert information. We can't always talk to our friends and family about the problems so it's a real support to have expert materials at hand. 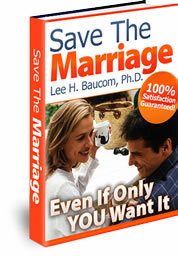 The "Save The Marriage" ebooks, reports and audio recordings are full of excellent information and ideas. I really like this product as it costs less than a single counseling session and comes with a 100% Money Back Guarantee if you're not satisfied. I can't even do that! Take Action. Rather than feeling helpless there is a lot you can do right now. Fill in the contact form on this page so we can talk about your needs, or order the ebook and get started. Marital counseling is an opportunity for you and your life partner to meet together with a trained professional to focus specifically on your relationship. Usually this happens when your marriage has suffered some damage, but this does not always need to be the case. For example, I also meet with couples who are planning to get married. You and your partner meet with me on a regular basis. You might choose to meet me for a set number of sessions or over a period of time (3 to 6 months, for example). The first session may take 90 minutes but we will try to work within 60 minute sessions after this. As a trained facilitator of the process I do not act as a judge, but work to help us to understand what is happening in the relationship and what can be done if you don't want this to continue. I do this by asking questions and drawing attention to what I see happening. I don't give you advice as there is no 'right' way of doing things. You need to discover what will work for you and your relationship. I will offer suggestions when necessary and you can try these out together. What if my partner refuses to join me? We'll discuss how we can go about inviting your partner to join us. If they choose not to participate you will still benefit from the process as you will gain insight into your thoughts, feelings and behaviour. With this kind of understanding you'll also discover ways to make changes in your relationship. Marital counselling may follow at a later stage.